They say it’s like turning a battleship. that never, ever, for a moment, lets up. with ropes and anchors and chains. Like turning a battleship, they say. I wrote this in 2006. An experiement, since wordpress doesn’t let me use my own formats. 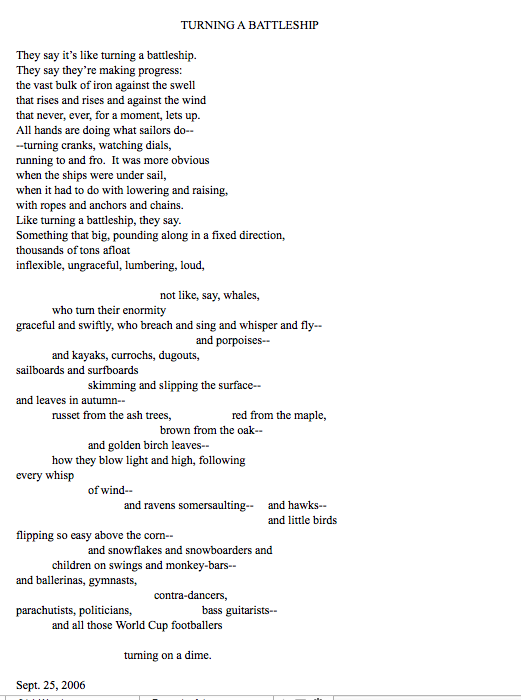 Here’s a screenshot of the poem–the words aren’t too legible, I think, but this shows the shape of it. This entry was posted in Humans and Other Animals, Myth Legend and Lore and tagged anger, politics, religions. ← Now will you publish the title?